Since 1999 Encounter Youth, a not-for-profit charitable organisation, has been managing Schoolies Festival™ at Victor Harbor, South Australia. Schoolies Festival™ is part of an extensive Operation that we coordinate to enable young people to celebrate safely, whilst minimising the impact on the local Victor Harbor community. Schoolies Festival™ 2019 dates are the 22nd – 24th November. Over 500 Encounter Youth Green Team Volunteers are actively involved throughout the operation. 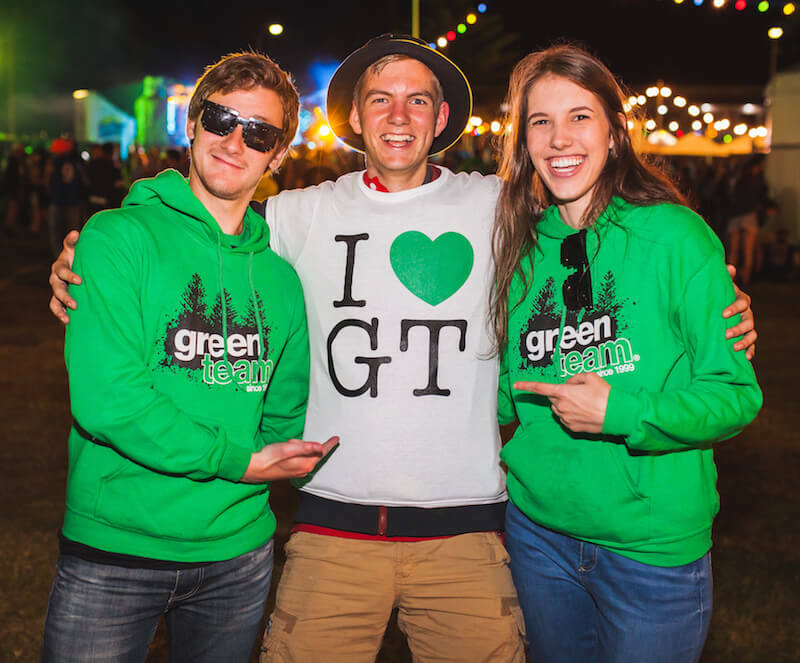 The Green Team volunteers come from Christian communities across South Australia. They are committed to making the Year 12’s Schoolies Festival™ experience as fun and safe as possible. In and around the Schoolies Festival™ site including the surrounding streets. At the endorsed accommodation providers 24 hours over the 3 nights. On every Free MAC Schoolies Festival™ Bus. Buses leave Adelaide Central Bus Station on the Friday at 10:00am and 2:00pm. Return buses from the Fleurieu on the Monday (see timetable on the app for times.) Book your FREE bus seat here. FREE shuttle buses operate from Encounter Bay to Goolwa from Friday afternoon to early Monday morning. Check out the travel page for more information, and download the free Schoolies Festival™ App (coming soon!) for an interactive schedule and map. Download the free Schoolies Festival™ App so you and your young person are informed about where to go, what they can do and the support services in place if they need to seek help. Before talking with your young person consider preparing what topics you would like to discuss and how you would like to approach each area. If there is more than one parent it is always important to have a unified front on every topic. Have the discussion with your young person. Encourage your young person with the positive decisions they have already made about planning for the event. Remember, the majority of Year 12 students who attend Schoolies Festival™ make great choices, have a great time and get home safely! Consider organising a routine time and communication method with your young person over the weekend. Schoolies Festival™ is open from 7:00pm–3:00am each night so it might be best to schedule your contact outside of that time e.g. maybe during the day between 11:00am and 2:00pm. If you are unable to make contact, try not to panic. Remember phone coverage can be poor at mass gatherings. This includes phone data. Consider having the numbers of your young person’s friends as an option to use if you can’t get in contact with your young person. You may also think about obtaining the phone numbers of the friend’s parents to contact them in a time of need. Social media may also be another great communication tool. Remember your communication style is important. Encourage your young person to tell you what they have already planned, rather than assuming what they have not planned. The most important thing is to reassure your young person that you can be contacted no matter what the situation. You may want to discuss another person that they could contact e.g. a family friend or sibling. Ensure they know the name and address of their accommodation.